I have a serious thing for potatoes (because carbs), but this recipe elevates it to an obsession. We’ve all had breakfast potatoes and mashed potatoes and french fries, but what about smashed potatoes? Yeah, get ready for crispy, tender potatoes with a flavor explosion. Carbs + sauce for the win. 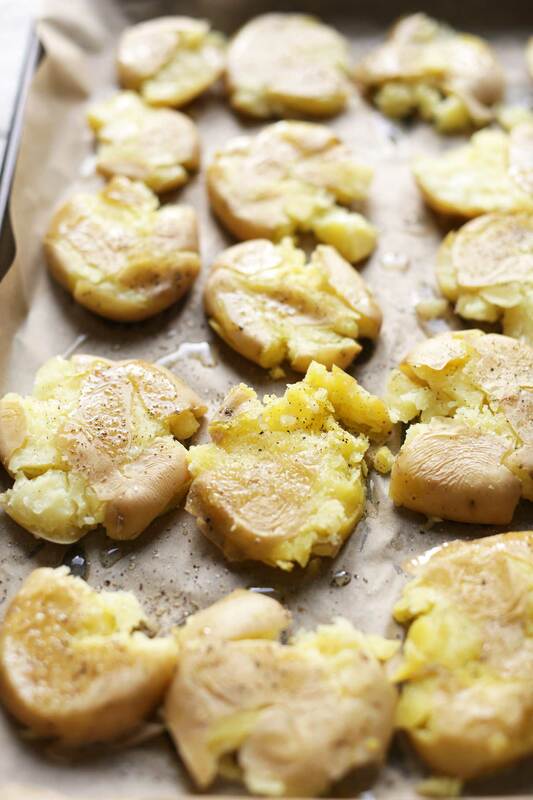 These potatoes are easy to make, requiring just 9 ingredients and about 1 hour to make! The concept is simple. Boil baby potatoes until tender. Then smash until almost flat and roast until crispy and golden brown. The result is a perfectly tender, buttery potato with golden-brown, crispy edges. While that’s happening, make your creamy, garlic-herb vegan pesto! Just 5 minutes to make, insanely vibrant and flavorful, and such a gorgeous green hue. Now, we’re ready for assembly! This would make the perfect hearty snack, side dish, or appetizer. They would pair with just about any cuisine, but especially Italian – think Simple Chickpea Bolognese, Butternut Squash Veggie Pizza, Eggplant Parmesan, Eggplant Stuffed Shells, Eggplant Lasagna Roll-Ups, 8-Ingredient Zucchini Lasagna, or Lentil Meatballs. If you try this recipe, let us know! Leave a comment, rate it, and don’t forget to tag a photo #minimalistbaker on Instagram! We’d love to see what you come up with. Cheers, friends! 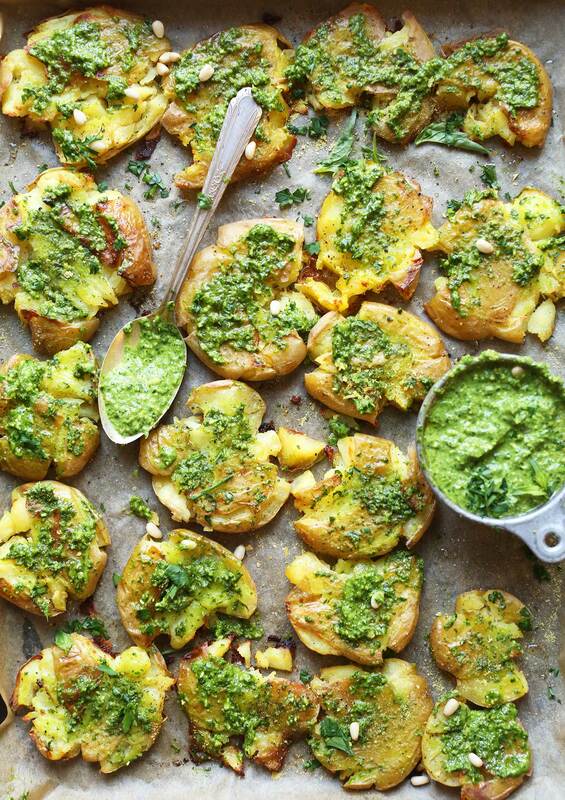 Tender potatoes smashed, roasted until crispy, then topped with a creamy garlic-herb pesto! A delicious vegan and gluten-free appetizer or snack! 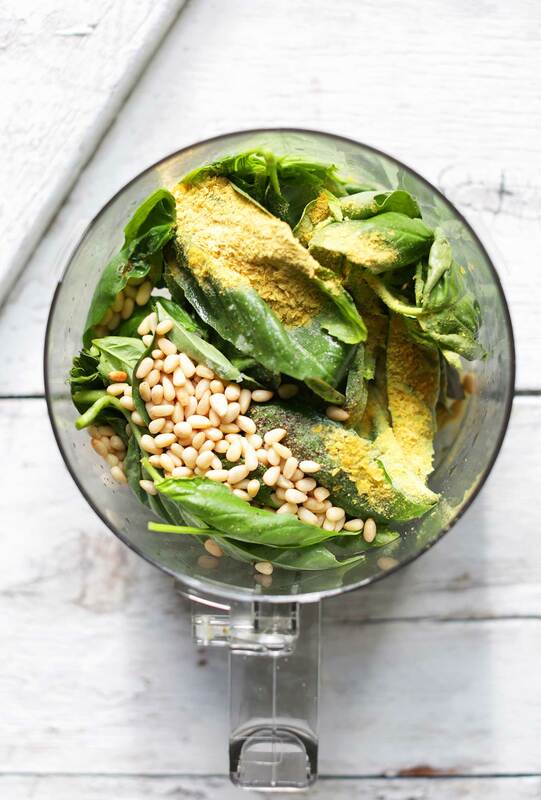 In the meantime, prepare pesto by adding basil, garlic, nuts, lemon juice, and nutritional yeast to a food processor and blending to combine. Stream in 2-3 Tbsp olive oil (amount as original recipe is written // adjust if altering batch size) a little at at time until a thick paste is formed. If trying to reduce fat, thin the sauce with water instead of additional oil. I like adding a little water to mine to make it more of a pourable sauce, but this is optional. Drizzle the potatoes with 1 1/2 Tbsp oil and season with a healthy pinch each salt and pepper (amounts as original recipe is written // adjust if altering batch size) . Roast for 20-25 minutes or until crispy and golden brown. *Nutritional yeast adds the cheesy flavor to the pesto. I purchase mine in bulk at Whole Foods, but you can also order it online. If not vegan, you can sub parmesan cheese. *Nutrition information is a rough estimate calculated with all of the pesto. *If you have leftover pesto, add it to scrambles, pasta sauces, Sweet Potato Lasagna, or this Pea Pesto Pasta Salad! This is a go to recipe for my family. It is sooooo good. Sometimes I dice up sundried tomatoes and add it into the pesto. Thank you for the wonderful recipe! We’re so glad to hear that, Monique! This pesto might be the best thing I’ve ever eaten. Pesto was one of the very last dairy items we were still eating because my kids LOVE it on everything!! This pesto is so cheesy and flavourful, my mind is blown. PS – I’ve made many many of your recipes and I love them all. My son has type 1 diabetes and celiac so your website is truly a lifesaver for us. Do you think it’s ok to boil the potatoes the day before and then roast before serving? Hemp hearts are an excellent sub for pinenuts. I use 1:1 ie 3 tbsp pinenut 3 tbsp hemp hearts. I made this as a side to bring to Christmas dinner. I LOVE how crispy the potatoes were! The pesto was a little too garlicky for me, so I will cut it to one clove next time. This is a fresh take on fried potatoes that everyone seems to really like! Thanks! Love this so much. We’re not a vegan family so we ate this with smoked tri tip. Since my son has food allergies we subbed in toasted pumpkin seeds for the walnuts. I do that with all my pestos and its a great swap! Can I use Dry Basil? It`s hard to find Fresh one in my town… or another sub? Hi! Yes you can! Because dried herbs are generally more potent and concentrated than fresh herbs, you’ll need less — For example, if a recipe calls for 1 tablespoon of fresh basil, you need only 1 teaspoon of dried, since 3 teaspoons equal 1 tablespoon. Hope this helps! Hi. This dish worked as a good side. 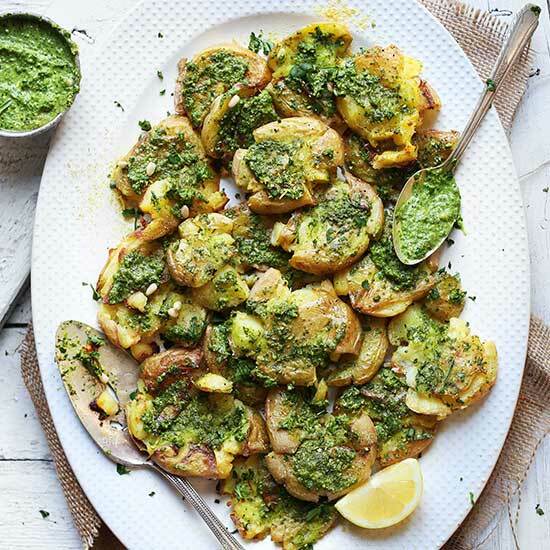 The potatoes turned out nice and crispy, and the pesto was easy to make. I used a combination of potatoes from Trader Joe’s. The purple ones didn’t smash as well as their Yukon counterparts, but it worked out fine. It is definitely worth using waxed paper so the potatoes do not stick to the tray. I would make this dish again. Just made this…..unbelievably good! I could have devoured it all!!!! These were sooooo delicious. I followed the exact recipe but I did use sunflower seeds because I didnt have any nuts. I know the recipe says ‘serves 2’ but my husband and I ate the entire thing. Thx Dana! I made this today, they are simply amazing. The potatoes turn out soooo crispy and golden and delicious! 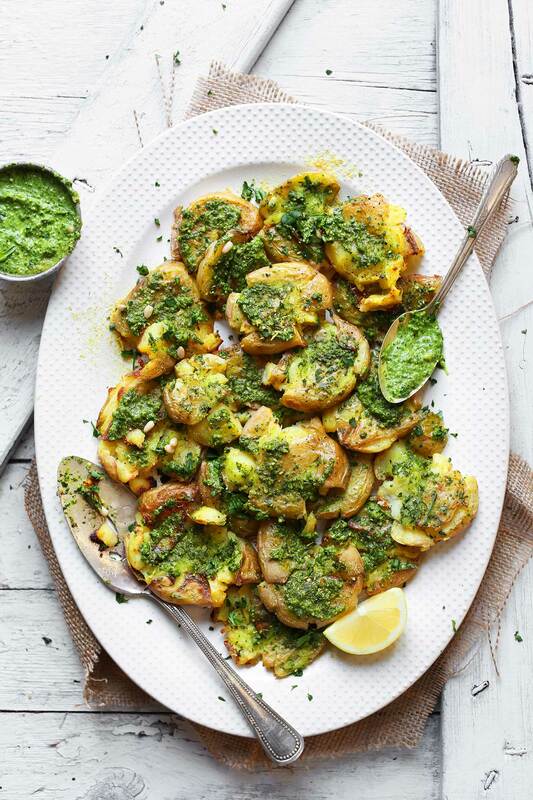 The pesto is so tasty and pairs perfectly with the potatoes. I don’t think I’ll be eating potatoes any other way now! Forgot to mention, I omitted the oil in the pesto and it turned out equally delicious, you don’t need to add anything else. Made this tonight and loved it. So did my wife. This was an incredibly easy dish that presented beautifully. I’ve been craving a good pesto since becoming plant-based and have not found a delicious equal until this recipe. I made these potatoes with the amazing Lentil Meatballs and it was to die for! Made this tonight and my whole family loved it! Subbed tree nuts from the walnuts and it turned out perfect. These look an awful lot like the crispy smashed potatoes from Oh She Glows. They are delicious! Hi! Can you boil the potatoes a day ahead? Do they need to be hot/warm before you bake them in the oven? Hi Em! That should work, but I haven’t tried it. Report back on how it goes! Made this for dinner last night (and have packed some for lunch today) – delish! I threw in some chia and reduced the oil for the pesto and it turned out perfect, Have used the pesto for a stir fried bell pepper dish as well, Thanks Dana! These are amazing! I made them for a family dinner last weekend and they were a big hit. The pesto is fantastic with the nutritional yeast. Could chopped hemp hearts be used as a pine nut substitute? Hi! Yes I think that would work! Oh wow, I just finished my plate – fantastic recipe! I used sweet potato and cut them into rounds. And basil is pretty expensive in my area right now, so I improvised using bits of mint, kale, turnip greens, collards, parsley and capers to replace it. (I juiced earlier in the day so I had some stuff left over.) The addition of nutritional yeast really brought it all together. I really enjoy your website – I have a lot of fun cooking your recipes! Oh, boy, this looks great. Big fan of smashed potatoes. This with the pesto, will try and snap and share my review! I’m trying to avoid using oil in my recipes so I was wondering if you think it would be okay to use something like maple syrup instead? Hi! I think that maple syrup would change the taste of the recipe, but if you are trying to avoid oil then I would recommend just roasting them without oil! Make sure to use a non-stick pan! These potatoes are terrific! I didn’t have any basil, so I made the pesto with cilantro and it was some of the best we ever had. I made some store bought vege burgers to go with and they were so much better with the pesto than they would have been with ketchup. I’m new to a vegan diet and your cookbooks and website have been a great help, thanks! Thanks Bob! So glad you enjoyed them. xo! Made this tonight. Didn’t put the oil on the potatoes and they still were brown and crispy. Delicious! I knew it would be, because every recipe if yours that I have tried turns out fantastic. Love the photos. What an excellent idea! You’re brilliant! You never seem to disappoint! Thanks for this recipe, I made the pesto last night (minus the nutritional yeast) it was so delicious. Thanks for creating recipes for us lactose intolerant peeps! For those with a nut allergy, would you suggest omitting the nuts completely? Or should I try to sub with sunflower seeds instead? I’m planning on making this recipe later this week! I would just omit the nuts from the recipe! Great looking potatoes! I’m going to try the recipe, especially that still I have some potatoes from my garden. Thanks for the idea! Jamie Oliver is a smash potato guy too. Or maybe it’s a Christmas/Sunday roast English thing. ???. I’ve made before too. But the pesto side is a good idea. These were awesome! I subbed cilantro for basil since I didn’t have any and used red potatoes, and walnuts. They were so delicious and crunchy-crispy! I will definitely make again. Thanks for sharing!!! Is there a way to make this without fresh basil? I see the appeal and all but I’m terrible at keeping basil plants and fresh basil is pricey around here. I buy the tubes of basil! They’re usually right by the produce and cost a little less overall. Thanks you guys, those are great ideas! A friend turned me on to half sage, half parsley (all sage is too sagey) pesto. Give it a shot, its amazing and cheaper than basil. And super easy to grow at home. Hmm, try refreshing the page and making sure your computer / browser are up to date! That is usually the issue. Yum! I just made a batch of pesto and now I have another use for it! YUM! I just made a giant instant pot full of potatoes last night, was wondering what I would do with them all! YOUR RECIPES ARE THE BEST! I just opened a vegan café in Brazil and whenever I need inspiration you are my reference number one! Healthy, delicious and simple. Love everyone of your recipes I’ve made!! But….Trying to cut down on oil. What would be a suitable substitute? Veggie stock?? I haven’t tried it with this recipe in particular but in other pesto recipes, I’ve just subbed half the oil for water. You do need a bit more water and it’s not as creamy but it gets the job done! Agreed! Water or veg stock will work! Hi! Water or veg stock will work! Love smashed potatoes! These look glorious lady! Drooling over that pesto..mmmm! Gorgeous. Love this idea, looks sort of like patacones (fried bananas). These would be just as good dipped in some home made ketchup! Patacones or tostones are not fried bananas. They are made with the larger “cousin” the plantain while it is still green. Just FYI. I think the secret to a perfect meal may well be carbs + sauce. These look phenomenal- oh, and that color! I wish I was eating them right now.